GT Zaskar Le Mountain Bike Bicycle Cycling 650b Frame Size 20"
GT Zaskar Carbon 9r Elite Mountain Bike Bicycle 29" Size 19"
GT ZR 1.0 54cm (2001) with Giant EXT Pro 1997 carbon aero wheels and GT carbon fork. Mike Burrows-designed Giant EXT Pro Carbon spoke wheels with Rigida DP 18 rims, taken from a 1997 Giant TCR. Don't miss out. GT XR1000 Mens Road Bike 57cm Large Frame. Shimano Ultegra running gear, Dura-ace gear shifters, Campagnolo deep rim wheels. Lots of spares for the new owner of this bike. In excellent condition. Perfect training bike. Local pickup only. Bank Transfer or COD preferred. GT RS Kids Micro Mini BMX Race Bike. The GT Power Series Micro BMX Bike is the mini version in the Power Series range for real junior riders wanting to ride a real BMX. A fun and fast little 20" wheel racing BMX. NOMAD SPORT. 26" Size Wheels. Kick Stand. DISC BRAKES, Front & Back. Good condition GT Compe for sale. Circa 2012 20 inch BMX. Fully functional with some moderate signs of wear and needs some minor TLC. Has always been kept garaged. See photos for an accurate description of the bike up for sale. Locally bought genuine GT Bikes BMX. Bmx bike GT Bikes SlammerRare competition edition. Good quality mountain bike with sought after low maintenance 21 sp gears that never need adjusting. suit novice riders or caravaners looking for simple low maintenance bike for occasional rides. Light alloy wheels with 26" near new tyres. Rear shox: Fox Racing Shox Float CTD SV, 6.5"x1.5" Air Shock. Pedal is NOT included. Front hub: All Terra Alloy, Disc, 15mm. Rear hub: All Terra Alloy, Disc, Cassette, 12x142 мм. © 2004 - 2019 Cycling Deal. FOX 34 Fork, FOX Float rear suspension- 140/130. GT Sensor Expert dual suspension trail bike. 27.5 wheel size. Happy to then hold for you to collect. RACE FACE bars and stem. Set up tubeless at present but need re-doing, or tubes put in. Rear Shock: Fox Racing Shox Float CTD BV, 7.25" x 1.75" Air Shock, w/Rebound Adjust and Lockout. Pedal is NOT included. Fork: RockShox Sektor Silver TK 27.5 Solo Air, 130mm Travel, 15 x 100mm Maxle, w/Lockout & Rebound Adjust, Tapered Alloy Steerer. GT SPEED SERIES JUNIOR EXPERT. High-end components from BOX marks a serious race machine, and the drivetrain has been specifically spec'd for light weight, stiffness, and snappy power transfer. This bike flies over doubles like they're one big roller, and gets you in and out of a berm faster than you can think. GT MTN BIKE. THE BIKE SHED. INSPECTION INVITED. 23" CROSS BAR CC. GOOD SEAT TYRES BRAKES JUST SERVICED IN HOUSE. GT ZASKAR Sport Mountain Bike Bicycle 27.5"
Gt DLSY Xl Bmx Bike. Condition is Used. Local pickup only. Model: Sensor Sport 29. Rear Shock: X-Fusion O2 Pro RL. Origin: Sample. Front Fork: Rockshox Recon RL. Crank Shimano Ultegra 52/36. Front Derailleur: Shimano Ultegra. Rear Derailleur: Shimano Ultegra. Shifters: Shimano Ultegra STI 11-speed x2. Fork: GT Carbon with tapered 1 1/8 to 1 1/4 threadless Carbon steerer, disc specific, 15mm thru axle, quick release rear. Condition is Used. Local pickup only. 9.30 - 4.00. Mon - Fri 9.30 - 5.00. WE WANT YOUR BIKE. Grab your phone and give us a call on 0433 702 250. PEACE OF MIND BUYING A PRE-OWNED BIKE. Made in 1998, hardly ridden. Grab a piece of GT history. We provide professional cleaning, photography, tuning and advertising on most popular websites. O.C. Linkage, Pivots, BB Shell, Dropouts. Handlebar: Crankbrothers Carbon. Headset Spacers: FSA Carbon. Stem: Thomson Alloy. Tyres: Maxxis Aspen 26"X2.1" Folding Bead. Saddle: WTB Silverado Team. You will usually receive a reply within 24 hours. 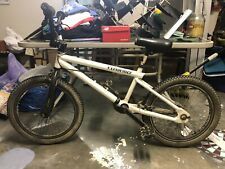 GT Bump BMX bike. Green and orange, in very good condition. All original. 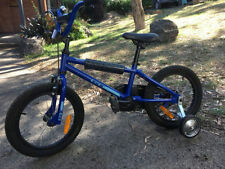 GT- BUMP BMX bike in excellent condition. Pick up only. GT PALOMAR - MOUNTAIN BIKE (SIZE L - 30") RED CRO-MO STEEL FRAME, 21 GEARS, GRIPSHIFT MAX GEAR CHANGE, FRONT FORK RAPID SUSPENSION TECHNOLOGY-RST. QUICK RELEASE(QR) WHEEL MECHANISM. TEXTRO QR LINEAR V TYPE BRAKES. QR ADJUSTABLE SEAT POST. SHIMANO ACERA DERAILER GEAR SYSTEM AND REAR SPROKETS. SRSUNTOUR FRONT GEAR SPROKETS AND CRANK. YO2000 WHEEL RIMS TYRES XC1-95R VERY GOOD CONDITION. Pedal is NOT included. Rims: Easton EA70 29" XCT Wheelset. Tires: Continental Race King ProTection 29" x 2.2", Folding Bead F/R. Hubs: Easton EA70 29" XCT Wheelset F/R. You will usually receive a reply within 24 hours. GT WISE BMX in great condition. Condition is Used. Local pickup only. Model: Traffic 2.0. Size: Large. Model: Sanction Elite 27.5. Rear Shock: FOX Van RC coil. Front Fork: Rockshox Yari RC 180mm. Pedal is NOT included. © 2004 - 2019 Cycling Deal. You will usually receive a reply within 24 hours. Hubs: GT All Terra Lightweight. 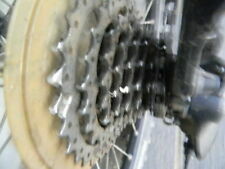 Rear Cogs: Shimano Deore XT, 10 speed: 11-36. Rear Derailleur: Shimano Deore XT Shadow Plus. boys bicycle. Condition is Used. Very little use. GT Aggressor. SR Sun Tour. L frame M3010 aluminium. Shimano V-brake 21 gears (7 right, 3 left) Wheels-26 ETRTO 559 x 19, aluminium alloy Local pickup only from Cleveland. GT Pro Freestlye Tour. GT Pro Series. GT Aggressor. GT Bicycles is a bike manufacturing company specialising in BMX and mountain bikes. Whether you need a bike for the commute to work, community racing, tackling hilly terrain or going for a ride around the park it's important to know what you are riding so you can get the very best out of it. Yes, the aesthetics of a bike are important however so is the performance to ensure you are safe and able to ride with your heart's content. On eBay there is a wide variety of GT Bicycles on offer not only with BMX and mountain bike designs but also road bikes too. To help you be able to cycle fast and keep the wheels turning GT have designed the frame of the bike to be as compact as they come with sizes ranging from 11 inches up to 29 in materials such as aluminium, steel and carbon. You will be ready for any race when you step foot onto a GT model but don't get ahead of yourself before you decide which suspension, gear type and wheel size you need to maximise comfort and performance. Once you are on your bike you can be sure to be safe with a range of safety options available for the GT including reflector lights, kickstands and even stabilisers if you need them. That way you can not only have a pleasurable ride but a safe one. Should you choose a GT Bicycle range there is no doubt that next time you take your wheels for a spin you will feel the difference. Be sure to select the right colour and specification for your biking needs and once chosen, find the cycling equipment to match to ensure you have the ride of your life every time.